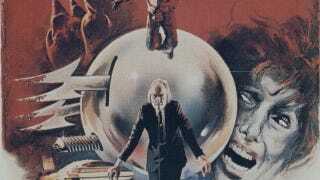 Phantasm is a 1978 gothic horror fantasy written and directed by Don Coscarelli. It spawned three more sequels, all of them about evil dwarf minions and flying silver balls that love exsanguination. A. Michael Baldwin plays Mike, a recently orphaned 13 year old living with his adult brother and guardian, Jody (Bill Thornbury). When Jody's friend Tommy is found dead in the middle of a graveyard, stabbed through the chest with his pants around his ankles, Mike doubts the official explanation of suicide and sets out investigating the strange events at the funeral home managed by a tall man aptly named The Tall Man (Angus Scrimm). After being menaced by diminutive apparitions, Mike enlists his brother and their friend Reggie and the trio set out to solve the groovy mystery of the Tall Man's mausoleum. Reggie, by the way, is a family man who earns a living selling ice cream out of a truck. Ice cream, not Quaaludes. Definitely not Quaaludes. Long story short: The Tall Man is robbing Earthly graves of their occupants so he can compress them down to zombie Jawas and send them through a tuning-fork-like transdimensional portal to work as slaves in an off-world labor camp. To protect his operation from the prying eyes of meddling kids, The Tall Man employs a flying chrome ball which embeds itself in the flesh of intruders and drains them of blood with a power drill siphon. Nefarious? You bet. But the Tall Man's program still polls better than the GOP's Medicare voucher plan. Along with the original, the Phantasm oeuvre is comprised of three sequels, released in 1988, 1994 and 1998. Each sequel picks up from a slightly retconned version of where the previous left off and follows the basic formula of Mike (now an adult), Reg and Jody (who has now been compressed into one of the flying chrome ball devices) teaming up with some combination of hot chicks and wise cracking kids to hunt down and kill the Tall Man, which is quite a Sisyphean task considering that the Tall Man instantly reincarnates whenever he's killed. Or does he? Yes, he does. Unless it's a dream. Which it's not. BOO! The end. Spanning the last two decades of the twentieth century, the Phantasm series is a microcosm of the evolution of the horror, science fiction and action genres. The first film is a slow, languid fever dream, with bizarre images and scenarios drawn from childhood nightmares. It's a moody suburban meditation on the autumn of childhood and the confrontation with fear, similar to John Carpenter's Halloween, which was released in the same year. I'm also pretty sure it's an allegory for the Vietnam War. The first sequel, coming some ten years after the original film, shifts gears into pure action. Mike, now played by James LeGros, takes on the familiar role of the reluctant action hero facing down a relentless nemesis in the tradition of Sarah Connor and Ellen Ripley. Killer cyborgs, acidic xenomorphs and alien undertakers? Feh. Nothing a good phased plasma rifle in the 40 watt range won't fix. The later sequels bring Baldwin back to play a more brooding, more emo Mike and while it's no mystery as to why no one took home an Oscar for any of these films, the restoration of the original Mike does give parts III and IV a better sense of attachment to the first film, especially as we learn more about the origin of the Tall Man and his relationship to Mike. Thankfully, Coscarelli resisted the temptation to turn the Tall Man into the kind of cartoonish self-parody that other horror villains became. Angus Scrimm's stoic, minimalist menace remains consistently creepy throughout the series. Coscarelli certainly doesn't seem to be shy about stealing what works. But considering that most of the films he references were likely inspired at least a little by the original Phantasm, he can be forgiven. Even in the first film, however, there's a scene where Mike visits a fortune teller who teaches him not to fear by putting his hand in a box which induces pain. It's not clear whether this Bene Gesserit encounter helps Mike much. If fear is the mind killer, the spiked silver ball with skull-penetrating drill attachment is a shoo-in for deputy mind killer. Coscareli's saving grace is that, like Quentin Tarantino, he invents with the same enthusiasm and gusto with which he borrows. Compressed Jawa zombie slaves? Brain-powered flying silver ball assassins? Tuning-fork-shaped trans-dimensional portals? Four-barreled shotguns? One sees such things and what can one say but "Coscarelli?" And yet, for all the seeming bad trip randomness and the paper-thin exposition, it's clear that Coscarelli has had at least a rough idea from the beginning of how all these elements hang together. The odd bits and pieces of his zombie Jawa industrial complex that we see on the screen suggest an intricate clockwork hidden just beneath the surface. And he's had the discipline and patience to reveal it at a leisurely pace without over-explaining or contradicting himself too badly. George Lucas and J.J. Abrams could have taken a page from his book. All four Phantasm movies are available on Netflix streaming.